Luring butterflies into your yard requires thinking about what butterflies like to eat and what else they need to survive. Creating a butterfly garden doesn't mean you have to sacrifice the beautiful landscaping you've been planning. 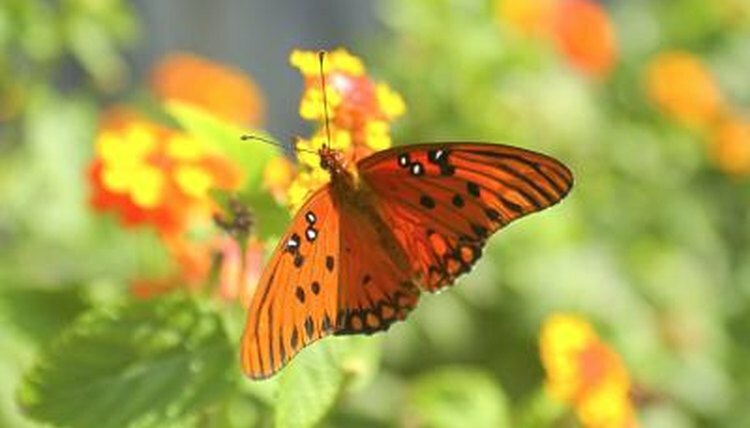 Incorporate butterfly-friendly plants into your landscape design to encourage butterflies to flit in your direction. Butterflies have delicate wings that don't hold up well to strong winds. Pick a spot in your backyard that is protected from the wind, such as an area beside a row of trees or tall shrubs. This gives the butterflies a place to find shelter in bad weather or shade when it's too hot. A butterfly garden needs sunlight, as well. This helps many of the plants thrive, and butterflies enjoy basking in the sun and warming their bodies when it's cooler outside. To keep your butterfly garden beautiful over the long term, choose butterfly-attracting plants that are native to your area. Butterflies enjoy the nectar from a variety of plants, so you can also pick colors and textures that fit with your landscaping plan. Try summer phlox (Phlox paniculata), for example, to attract butterflies in U.S. Department of Agriculture plant hardiness zone 4 through 8, or try blazing star (Liatris spicata) in USDA zones 4 through 9. Black-eyed Susans (Rudbeckia hirta) and purple coneflowers (Echinacea purpurea) offer butterfly-friendly color in USDA zones 3 through 9. Many annuals, including cosmos (Cosmos bipinnatus), provide seasonal nectar. To encourage butterflies year after year, add some plants that caterpillars need. The butterflies are more likely to lay eggs in your garden if they find plants there that the caterpillars can eat. When the caterpillars metamorphose into butterflies, they'll still have everything they need in your backyard. Some like trees and shrubs, but others, such as Monarch butterflies, lay eggs only on milkweed plants, such as butterfly milkweed (Asclepias tuberosa), which thrives in USDA zones 3 through 9. Many caterpillars enjoy asters in USDA zones 3 through 8, or you can opt for caterpillar-friendly annuals such as snapdragons (Antirrhinum majus). Butterflies enjoy supplementing their nectar gathering by drinking water, from which they gain minerals. Set up safe drinking areas in shallow pans filled with sand and pebbles, water barely covering the material in the pan. You can also bury buckets filled with sand and pebbles if you don't want them to stand out within your landscaping. Butterflies also enjoy an occasional sip of fruit juice in shallow containers filled with pebbles.